You’ve decided you want a new car but before you drive off with your brand-new wheels, you need to make a plan with the old car. That’s where the dilemma comes into play. Do you sell or trade it in? 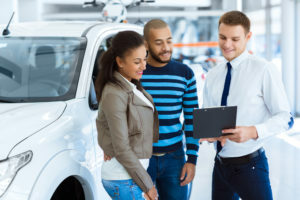 Many car owners prefer the hassle-free option of trading in the car at the dealership, despite getting a lot less than they would’ve got had they sold it instead. Other customers prefer selling their car through dealerships like us where they get a much better price for their current vehicle. At the end of the day the choice is up to you, but have a look at these tips before making your final decision. The convenience of trading in your car comes with many benefits: no phone calls or meetings with sellers that might be time wasters, and no test drives with complete strangers. At best you should expect to get your car’s wholesale value which you can use to start the down-payment on the new car. What they don’t tell you is that while you might think that you are getting a great deal, they’re actually just reducing their profit earnings on the car. Book value: The industry accepted value for your car. Trade in value: The amount the dealer offers you when you trade in your car. Retail value: The trade in price plus whatever mark-up that dealer adds on to that amount to make a profit. Selling your car to a dealership comes with its own advantages: BuyCentre offers a quick and hassle-free service that will put your mind and wallet at ease. Knowing the value of your car is easy with our app and the best part is that we WILL buy your car for the quoted amount! Selling your car to a dealership like us ensures that you get the best market related price for your car which you can use to purchase another car from any car dealer of your choice. Unlike trade in’s, you aren’t locked into buying a car from one dealer, giving you more choice when it comes to buying a new car and finding a REAL BARGAIN somewhere else. When you sell your car to a private dealer, you essentially act as the dealership and add your own percentage of profit to create your own custom retail price. What they don’t tell you is that you’re probably going to face overlapping car payments if the old car isn’t paid off yet. In some instances, you might not be able to sell your car straight away, in which case you won’t be able to use the money as a down payment on the new vehicle. Of course, we suggest selling your car to us instead where a network of 300+ dealers are able to make you a guaranteed offer. Click here for more info on how to download the app.